Below is a self portrait of Mars Science Laboratory Curiosity at Rocknest created by combining dozens of high resolution images taken by the rover on 31 October and 01 November 2012. 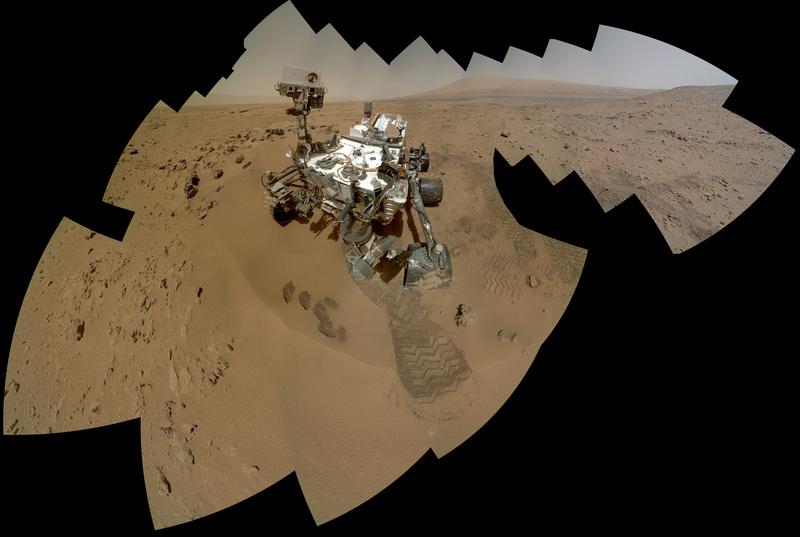 A previous self-portrait at the same location did not include the magnificent view of MSL's ultimate target, Mt. Sharp, that this photo does. You can see in this photo the five scoops MSL took out of the soil at Rocknest in order to first calibrate its sample-handling mechanisms, then test the Martian soil to determine its content. You can also see tire tracks made by the rover as it moved into Rocknest. If you click on the image below and zoom in you will be better able to appreciate the majesty of Gale Crater's rocky terrain. You will also get a better view of Mount Sharp and the clays that lie around the base of Gale Crater's central uplift. They allow scientists to assess the health of the rover and it's wear and tear over time. Being able to see dust buildup and soil accumulation will help scientists plan accordingly and let them maneuver the rover in such a way as to displace settling material or prevent further accumulation. Self-portraits serve as great public relations tools for NASA because they let the public place a 'face' with the name and connect with the rover. It lets people see something from Earth on another planet, which truly is inspirational. Taking self-portraits on the way to Mt. Sharp will help catalog the journey and make it more relatable to people. Imagine that you were to on a trip to each of Earth's seven wonders of the ancient world, taking photos along the way. Wouldn't it be more interesting to your friends and followers if they could see you in the photos? Seeing a person in the photos allows others to live vicariously, and while Curiosity is not a person, seeing it in the mosaics of great Martian landscapes has the same effect. Curiosity, robot though it is, is something people can emotional connect with and it is that connection that will encourage more people follow it's discoveries on Mars. Contextual photos like the one above will serve as a means of both tracking MSL Curiosity's health and keeping the public intrigued about current and future discoveries the rover makes. In 2013 I look forward to seeing many more of these photos and rejoicing in each discovery made by Mars Science Laboratory Curiosity! See other photos of Mars showcased by Mars Travel! Five Impacts, Same Time - How?